It’s time to talk about ciorba de burta (chore-buh day boor-tah)) which is a mainstay of Romanian cuisine. Literally it is tripe soup, which the name alone scares off a lot of people. 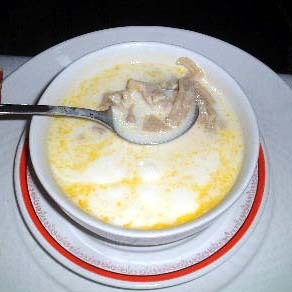 Since tripe is something of a mystery meat to a lot of people, let’s get into what it is (esp in Romania). Every cow has four stomachs or to be more precise, four chambers of one large digestive system. Tripe is the stomach lining of the first three of these stomachs (or chambers). It is carefully washed to remove all undigested plant matter and then is cooked in this soup to provide a unique taste. Despite the fact that some people consider “cooked stomach material” to be unpleasant, it really isn’t fundamentally different from cooking and consuming other parts of the cow for meat (assuming you eat meat). This soup is a direct descendant of a similar Turkish soup and Romanians kept this recipe for a good reason – it’s delicious. It is a ciorba, which is a very “thin” soup, mostly all broth. It has a high fat content mixed in with a delicately balanced sour component. It is served hot with a dollop of (cold) sour cream mixed in and every spoonful or so is mixed with a bite of a hot pepper (ardei iute). Although I do not consume meat products anymore, I can tell you from previous experience that this soup is delicious. Coming from an American perspective, I often think of Jewish tradition and how a bowl of homemade chicken soup can cure almost all minor ailments. Think of ciorba de burta in the same way, if you will. Its most famous use however is as a cure for hangovers. Below is a hilarious and fun video celebrating just this very thing. It starts with a long and funny story (in an exaggerated Transylvanian accent) by one of the few truly funny Romanians, a stand-up comedian who goes by the name Raba. I couldn’t find the lyrics of the song online but the chorus goes something like “damn how yummy ciorba de burta is/especially with sour cream and some peppers”. Apparently this recipe truly does have a powerful effect on hangovers because it is rich in electrolytes. Plus because it’s a “thin” soup, you’re ingesting a lot of liquids to combat dehydration. All in all, unless you’re a strict vegetarian, don’t pass up a hot bowl of this soup, particularly if you’ve overdone it the night before. Pingback: Mici, Photos, a Swede, A Trip to the Hospital and Painting Gypsy Fingernails « I'm More Romanian Than You!